The October SMG (South Florida Miniatures Gamers) club game was held at our club house affectionately called Das Kreig Haus and is located in Downtown Fort Lauderdale Florida. We had a very good turnout with16 people in attendance. Jorge set up a cool FIW game with real simple, fun, and fast rules he picked up at a SYW con many years ago. The rules are good fun, they just needs a morale rule, in my humble opinion. Please see the attached rules pics, only (2) pages. Thank you Jorge for running a very enjoyable game, I do believe fun was had by ALL! We even had one new gamer attend our club house, Ethan who came down with Bob and played on the English side. Ethan is a friend of Bob's and a member of Bob's regular gaming group. We hope he decides to join us more often. Rob Maxwell and his buddy Mark whom I've gamed with many years ago and see at the HMGS-South cons even stopped by to say hi and check out Das Kreig Haus, hopefully they return to game as well. Stephen even drove an hour and a half from Stuart to join us! Jim brought his aides de campe (two young sons) but did not play today as they were more interested in other things than the dice. And as usual John G came by to say hello about mid day and hung out with the crew. French Marines defend fort Le Froge from charging Militia. The British column moves up the road. Ambush! Roger's Rangers get wiped out, one man survived! 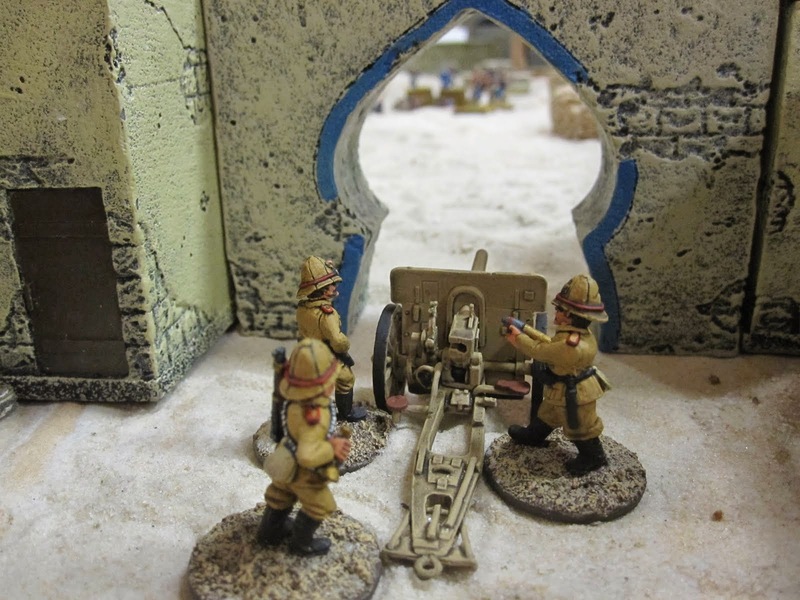 The Brits are counter attacked by the Canadian militia aka Les Canadians and a brave band of French allied Indians. The British retreat and are pursued by the settlers, French Marines, and Les Canadiens Militia. The gun is lost and the Grenadiers suffer badly.The British retreat but with their head held high. They will most assuredly return, with reinforcements of course, to punish the villainous French colonists and invaders. For the moment the valley remains firmly in the hands of the French and their allied Native American tribes.